News of the Nigerian military truce with Islamist militants Boko Haram broke as 40,000 Christians – many with Nigerian roots – gathered for a night of prayer at London’s Excel centre on Friday (17 October). Fervent prayers filled the auditorium as they prayed that the promised release of 200 captured schoolgirls will go ahead. Pastor Agu Irukwu, the leader of the Redeemed Christian Church of God in the UK, said: "We hear that part of the benefits of the truce will be the release of the girls. We don’t know whether it is authentic – but we have been praying for these girls; we must never forget them." Together the 40,000 people at the massive prayer event raised their voices to pray that the girls would be reunited with their families. The Archbishop of Canterbury Justin Welby, who has visited Nigeria 75 times, was the guest speaker at the Festival of Life run by RCCG-UK. He said the Anglican Church needed to learn lessons in prayer from the RCCG churches. His first priority as Archbishop, he said, was for "a renewal of prayer" in the UK and in the Anglican Communion: "a renewal of prayer and of communities that pray". "There has never been a renewal of Christian life in this country without there being a renewal of prayer," he added. 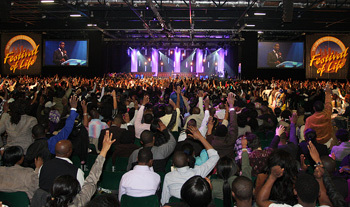 The Festival of Life saw the launch of three months of prayer throughout the UK using a specially-produced prayer calendar published for HOPE Together by national Christian broadcaster UCB, and distributed free to churches of all denominations throughout the UK including the 40,000 RCCG members gathered at the Excel Centre. Acknowledging the role of HOPE Together as a catalyst, bringing churches together, Archbishop Justin said: "You keep finding them popping up here and there making things happen, bringing people together and doing the right thing, in the right way, at the right time." Roy Crowne, Director of HOPE Together said: "We have so much to learn from the Black Majority Churches about fasting and praying. Last year I was a guest at a prayer event in Nigeria with more than a million people praying. HOPE is thrilled to be working with the 720 RCCG parishes in the UK to spread the hope Jesus gives. When Christians pray, things change. We hope that thousands of people will join us over the next three months as we pray for the UK."